Hi! This blog is so wonderful to read. Thanks to all of you! by Graeme Sullivan (Graeme is one of my former professors at Teachers College in Art and Art Education and is extremely immersed in developing the new-ish thinking about art and art-making being valid and sometimes stellar! forms of "research". His book is dense in places, naturally but he uses many artists as concrete examples and I personally know one or two of those. Graeme makes art installations out of 'found' materials and places them where people can encounter them where they might not ordinarily expect to see an "art object". He then revels in the idea that the people who encounter these pieces often change them, sometimes even destroying them completely. He follows this up by later revisiting the sites to see what has happened to his "art", and documenting the changes. When I first learned of his process I had a strong personal reaction of: "I would never let that happen to my art!" and "How can he let his art go like that?" But the point was he did not need to be sole author or producer; he was inviting the participation of others and welcoming it. The question was asked below: "How do we as individual artists feel about making art that involves the audience in the works? What are the values and drawbacks of this type of art-making both for the artist and the audiences?" The short answer is, there are many feelings involved, like in any art making. My feelings about creating public art have sometimes included feeling ostracized by my "art gallery art friends" whose work hangs on walls and SELLLLLSSSSSSSSS (well sometimes sells anyhow) and I have wondered to myself: "What is wrong with me? Why can't I be more practical?" On the other hand, unlike Graeme, who I deem to be very unselfish in his public art process, my "new genre public work" in the public domain has always been "purpose-driven (issue driven)". This fact has soothed my sizable artist ego: having had a clear "outcome" in mind, i.e., to get the attention of the viewers and to rouse them to actions (that I have personally pre-determined to be worthy, of course). The downside of this stance is that once you inspire people like that, they keep wanting more inspiration and now you "supply the stuff". And maybe you feel tired, and are wanting some down time, or alone time in the studio. Somehow I recognized this could get problematic early on and so I sometimes used pen names for my public art work so that I could anonymously inspire people while leaving the name "Triada Samaras" alone for my "real art" (done in private). I needed to create boundaries for myself as I can feel overwhelmed by things sometimes. Plus I am a very private person and I do need my down time. I didn't want or need "Triada Samaras" the "Artist/Poet" to be solely known for provoking people as much as I wanted people in the community to know an anonymous artist/activist was "out there in the world", caring about things like community issues very deeply and would not "keep quiet". My very first piece of Public Art was a protest poster and flyers I plastered all over my neighborhood. 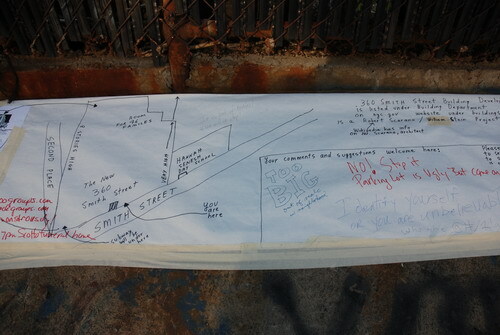 I was enraged about the coming development called 360 Smith Street across the street from my beautiful house, ruining the center of my beloved neighborhood with its charming narrow streets, trees, and front gardens. This beautiful neighborhood had made living in NYC bearable for me (and many others) for many years, and to see it violated by greedy, uncaring developers intent on selfish profit like this, was utterly unbearable to me. And the local, neighborhood scoundrels (in bed with the developers) were trying to sell the public the idea, as horrible as it was. In Brooklyn, there are so many, many posters and flyers everywhere. How could I find a way to get noticed? Here I got a bit discouraged. How would I draw in my audience in this cluttered visual culture? What could I do to make people really care to stop and read it? I decided to ask for their comments about the coming development on the poster and they answered. I also used a bit of the NY humor/sarcasm on both the flyer and the poster that we all speak here, as I felt people would appreciate it. And they did. I used a common language we could both understand. This aspect felt very, very exhilarating to me: like a new discovery! I could speak in a way the public could understand. After all the years of isolation as an artist/poet, I was not so different after all. Next came the realization that if we could speak in the same language, then maybe I had found a new way for myself to communicate to the public my "BIG IDEA", the one that is bigger than even the over sized development to me: the idea that: "ART MATTERS". This, too, happened in time. When I was finished hanging all the flyers I wrote to someone at a real estate and development blog. Until that night, I had never read a blog or used one, techno-phobe that I had been for years. Yet, six hours later, "Athena Lloyd Wright: The great grand daughter of Frank Lloyd Wright’s first cousin by marriage" was in the news, and you could do a google search for her. (Today you still can) WOW! It turns out that this blogger/journalist I befriended by internet and by chance that night was more than just a little interested: He was VERY interested, as the architect, Robert Scarano, was in the middle of so many scandals in NYC (and still is) and this blogger, Bob Guskind, had been following him. Overdevelopment of Brooklyn was Bob's PASSION, and not just my tiny corner of Brooklyn, but all over Brooklyn there were many stories exactly like mine. In fact Bob's entire blog was devoted to just that. Thus this little poster/flyer making exercise began all the furious community artist/activist in my life for the next two years until now. How did that feel? Like a lightning strike of sorts. Exhausting. Exhilarating. Scary. Full of electricity. But it made me realized in awe that we artists do have a LOT of potential to "activate" various community situations because we have so many "tricks" under our belt, and with that power comes, of course, the inevitable word, responsibility. Smith Street Revolt Brewing Over Shiny New Building? That building that could rise (link) at Smith Street and Second Place in Carroll Gardens has, um, struck quite a chord in the neighborhood. First, we got an email from our original tipster noting common ownership of the lot at 360 Smith Street where the eight-story Heavy Metal Building designed by architect Robert Scarano would go and of the neighboring school. It also noted that apparently the building has been changed from shiny silver to more of a red brick design. Another email arrived to note that the MTA, above whose stop the building would rise, has apparently signed off on the project. (This is a no-brainer here)…There is a better way! Let’s all work together to find it! 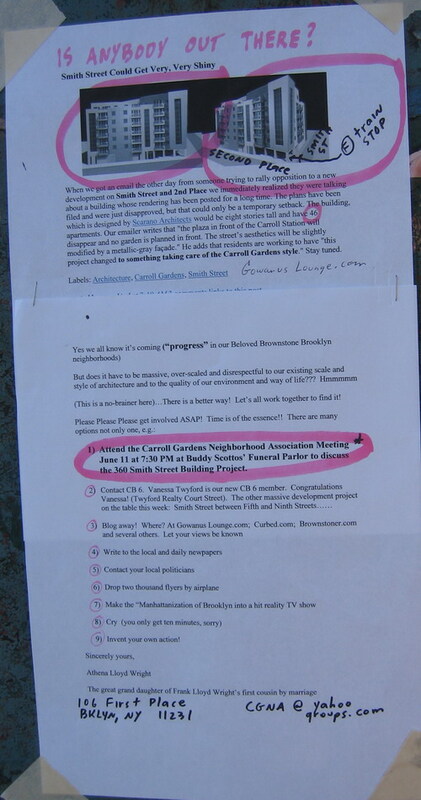 1) Attend the Carroll Gardens Neighborhood Association Meeting June 11 at 7:30 PM at Buddy Scottos’ Funeral Parlor to discuss the 360 Smith Street Building Project. 9) Invent your own action! The flyer is pictured below. We don't think we've heard the last of this by a longshot. Britta here. This is truly inspiring. I can't write much here now, but it strikes me as interesting on a number of levels. Like I said the other day on the call, I am thinking a lot about community: what it is, how it works, what I want it to be. What I like about your work here is that it emerged organically from a feeling and a need and that you were/are able to connect with others who are also coming from that same place. It's not like you need to be an artist to do this, though it helps enliven the work. 4) i work based on feelings/hunches and other "unexplainable phenomena"
I take these traits mostly for granted as an artist, and teaching artist, but seeing myself in a group of non-artists and in a non-classroom situation, i saw my value in a new way. of the things we artist bring to the table. I noticed also that I was still functioning as an "ARTS EDUCATOR" even as I became a community/activist/artist. Thank you for giving the low-down on what your "role" as the artist was and how it morphed. That is when community works the best, I think, is when you come together and all give and get and become each other. nice! Ah, Dear Triada, I wrote a response and did not know how to post it... and lost it. So this is a test in how to post comments.